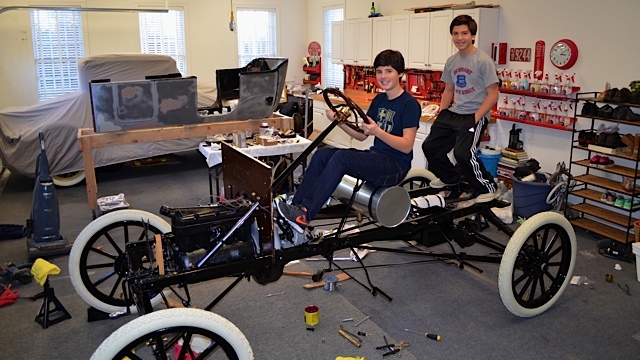 On "Black Friday" 2014, my best friend Mr. John Torchia, myself and my 14-year old son, with two of his friends gathered in the garage at 9:00 with a goal to complete the chassis of my 1914 Touring by 3:00. This six hour time-lapse reduced to 30 seconds is very cool! Hope you enjoy it as much as we did! Great getting the kids involved in the project. That was a nice video and faster then the Ford assembly line! 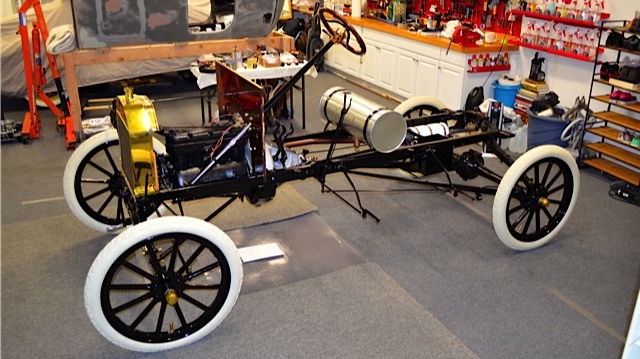 Whoever said young fellows don't want to get involved in the car hobby were just proved wrong. How many skinned knuckles? That was neat but a little too fast, LOL. 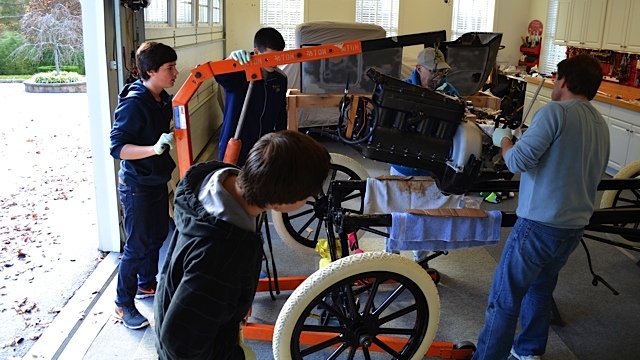 Having help can be tremendous in getting things done. I have OCD when it comes to how I want things done, and thus causes issues when working with others sometimes. Therefore I will never finish anything. Get the kids involved! They had a great experience they will never forget! 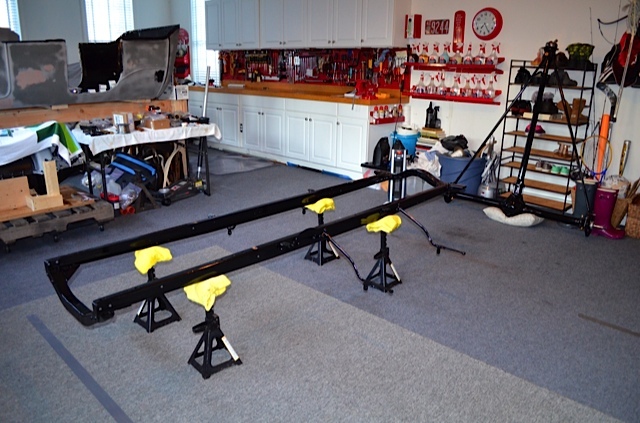 The very best thing about this video is seeing all those young guys involved putting that car together. Gives you hope for the future. I teach at an engineering college and even with these kids, if it's not a video game or can't be done on a computer, there's no interest. I think all they need, though, is encouragement and a little prodding, like in this video. 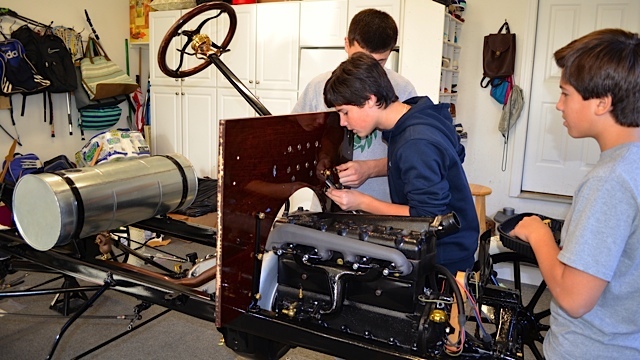 If we can spark a young man's interest, not only are we doing good for the hobby and future of old cars, but we are doing that kid a huge favor by turning him on to something that's far, far better than video games. 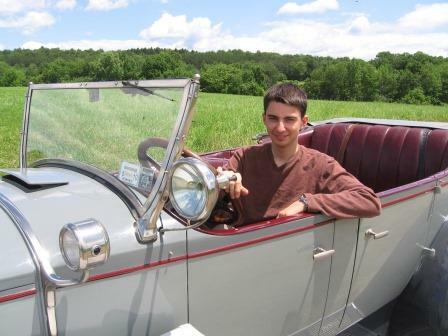 I did have one student in 2009 who showed interest in my '26 Packard which I had at the time. I took him for rides and taught him to drive the car. He really enjoyed it and was very good. And it was a wonderfully satisfying experience to sit in the back seat and be chauffeured around by a 19-year old. I really enjoyed teaching the boys some of the assembly techniques that I have successfully used for many, many years. They were great kids and had a really good experience. Very cool indeed! Nice work Gary and team. Also impressed with how clean and well organized your garage is. Nice job Gary and guys! From all of us in Room 6.